Unless you've been living on Mars, I'm sure you've noticed that copper is the colour of the moment. Whether it's make up, homeware or clothing, copper hues can be seen pretty much everywhere. When it comes to copper home decor, it can be quite expensive and you can soon find yourself spending £40+ on just a couple of items. With copper homeware wish lists up to my ears, I went down to my local Hobby Craft to see what was on offer. 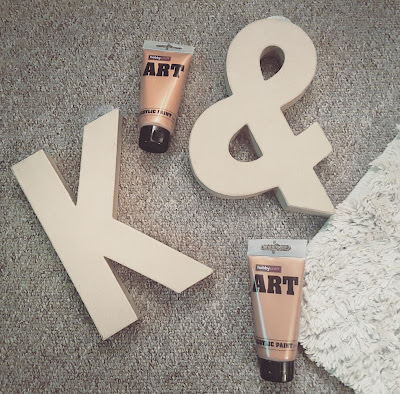 I picked up these Mache letters and Acrylic copper paint for just over £10. I knew these would just sit on a shelf at home so there was no need to use a hard wearing, expensive paint or to top coat them. 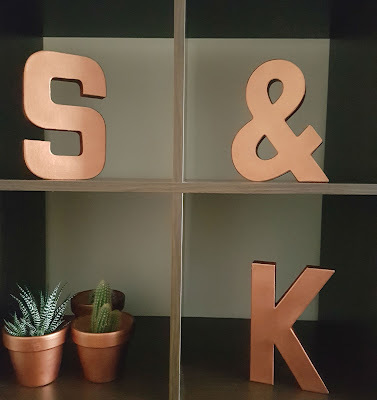 The Hobby Craft own brand paint is £2 per tube and this copper shade was perfect. I was super happy with the final result. You really can't tell they are cardboard just by looking at them! I love how they look metallic but are still matte. 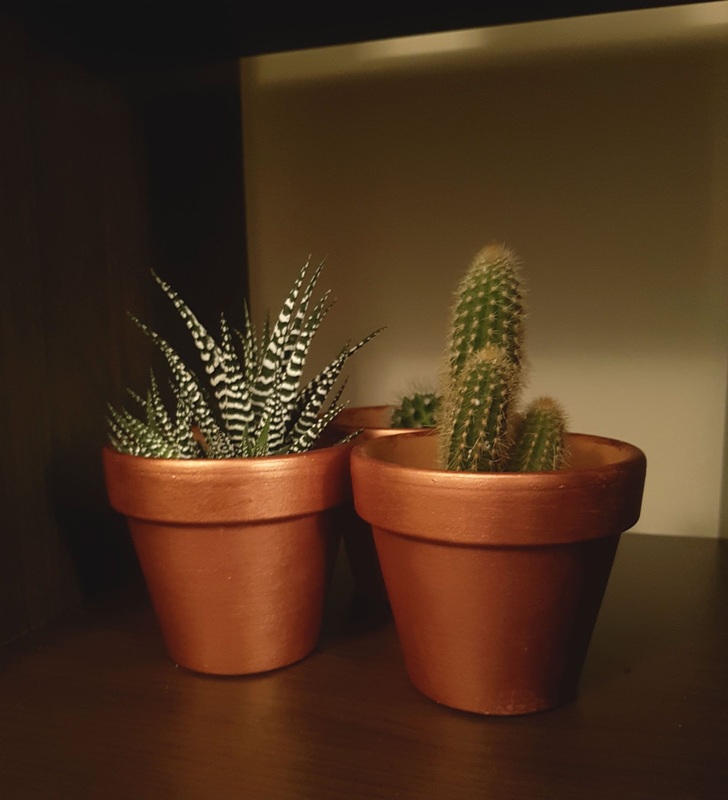 I'd been looking for some copper pots to put my growing succulents in but all were really expensive. I had quite a bit of copper paint left over from the letters so I went to my local discount store and picked up some plain terracotta pots for 60p each, bargain! The acrylic stuck really well to the terracotta and I only needed one coat. I loved the rough, brush marks that it left and gave a really nice effect. If you want a more hard wearing finish, you can always apply a top varnish or sealer. And here's how it all looks! 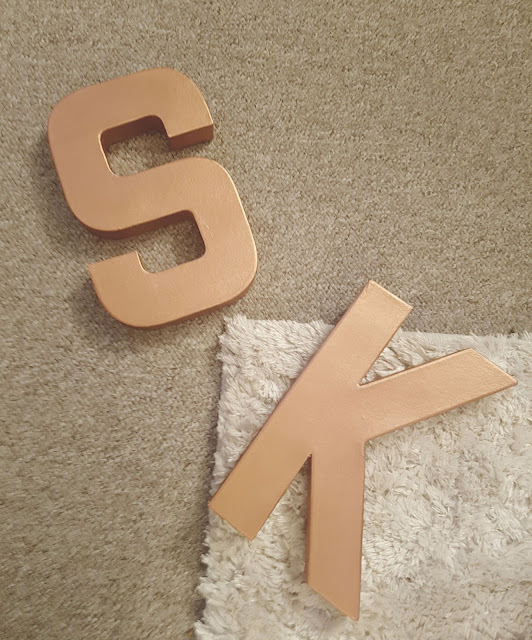 We are currently decorating our front room and painting our furniture so it ties in with the copper decor. Keep an eye out for the finished look! This is such a great idea! That shelving unit looks awesome. I'm gonna give this a go with some plant pots, not sure my painting will be as neat as yours!